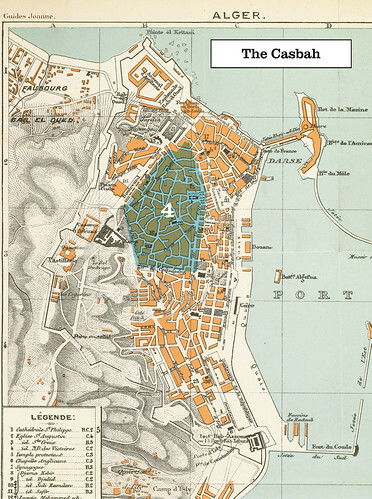 1888 Plan of Algiers, Algeria–Casbah region, originally uploaded by Getty Research Institute. I love old maps. They seem to have a sense of history, and often the lines give a sense of geography that can be missing in a modern flat map. For today’s prompt, use an old map as a jumping off point to create the geography of a story. Where do things occur in relation to other events? Does studying the map give you an idea for an intriguing setting? Can you recreate/twist the map for a unique world? So many possibilities! and all this time i thought it was “Rock the Cat Box”… kidding. like the map. That’s what my cat says every time he uses the litter box. Cool map, isn’t it?